Accidentally I came across this book with a word as its title that looked strange and yet vaguely familiar. I didn’t immediately recognize its meaning. But when I opened the book, the photographs made instantly clear that the artist let himself be inspired by folk traditions of dressing up in foliage, straw, sheepskins and the like, to symbolically enact encounters of mankind with nature spirits, or spirits of wilderness. And indeed ‘Wudewasa’ refers to the Wild Man, who can be the Green Man of vegetation but also the spirit of cattle, or of nature in general. Matthew Cowan (yes, Cowan…) was born in New Zealand. Before turning to the arts, he studied psychology. Around that time he and his friends wanted to be in a band, “but none of us were really musicians, so we became Morris dancers,” he tells in an interview at the end of the book. Living in New Zealand in the 1990s they didn’t know much about Morris dancing, so they relied mainly on their own imagination. They started performing under the name of Green Man Morris and had a great time. He also discovered the idea of the Wild Man. Depictions of the Wild Man (usually as Green Man) can be seen on buildings or in churches. The body of the Wild Man is covered in hairs or leaves. This character dates from at least the Middle Ages and lives on in diverse folk traditions. He is only half human, i.e. half civilized, and his non-human part often transgresses the norms of society. Wild Men characters and people wearing costumes during carnival can show lewd behaviour that wouldn’t be acceptable under normal conditions. They have something devilish about them and they may be frightening, but they can’t be called bad or evil – or good for that matter, for they represent the world of nature, which has no notions of morality. The Wild Man inspired Cowan to a series of ‘Wild Man’-costumes of his own devising. 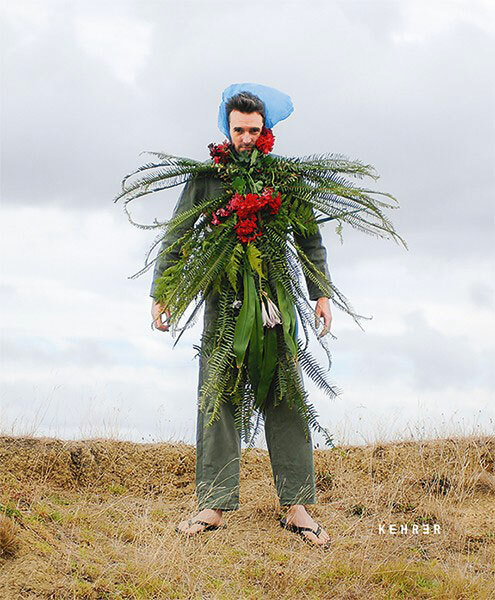 Wudewasa contains the essay ‘I am another’ in which Andreas Bee explores the principle of masking, and the interview with Bruce E. Phillips I already referred to, but it consists mainly of photographs of the artist, standing with his feet apart and arms slightly away from his body, wearing enormous ‘beards’ of flowers, ferns, grasses… Or a bodysuit completely covered in red and white ribbons with Morris bells, or chicken feathers, or synthetic wigs. There are also two Krampus-type costumes made out of plastic drinking straws, one white and the other black, called ‘Strawdevils (Day & Night)’, as well as two ‘Equinox Men (Spring & Autumn)’ whose ‘fur’ consists of strips of red/yellow and black/green orientation tape. Those reminded me of the modern shamanic dress made by Daan van Kampenhout out of plastic bags, which I saw years ago at the exposition on shamanism at the Tropenmuseum in Amsterdam.